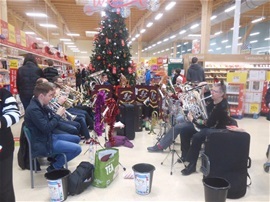 As usual, the band was kept busy during the festive season, by performing at a range of Christmas Fayres, the Light up a Life service at Lakelands Hospice, a formal Christmas concert at the Corby Silver Band Club and carolling in some of the local supermarkets. 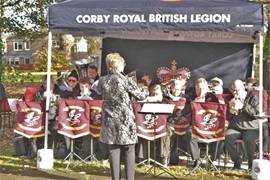 On Sunday 12th November, members of Corby Silver Band played at the annual Service of Remembrance at St. John's church, organised by the Royal British Legion. This year the whole service took place outside the church due to the number of people who were attending the event. The Last Post and Reveille were played once again by the band's principal cornet player, Dave Ashby. On Saturday 16th September, Corby Silver Band took to the stage at Cheltenham Racecourse representing the Midlands area in the National Brass Band Finals of Great Britain. We had rehearsed the chosen test piece ‘Petite Suite De Ballet’ and performed it in front of an audience during our open rehearsal the evening before. We had a lot of positive feedback from members of the audience, which gave us a real boost. There is purposeful intent right from the opening bars of this performance. The military style is captured with the right mix of fun and confidence builds through the ranks. 'Pas Seul' is one of the nicest of the contest so far. Well done all, and the solo contributions enhance the performance. Hats off for the 'Minuet' — just the odd moment along the way, but so musical in its delivery. We close with an 'Ensemble' that just faded away at the end despite that robust few final bars. An account that had a lot to admire in terms of musical character. It just faded at the end, which was a real pity. After all the bands had performed we waited for the results. Although there were plenty of positive comments from both adjudicators, they obviously wanted to hear something different, as we were placed a disappointing 17th out of the 20 bands taking part. But there was no doom and gloom, as there were lots of reasons to be proud of ourselves. We were the highest placed out of the 3 Midlands area qualifiers. We had worked hard as a team, dramatically improving the overall ability of the band. We were able to attend the finals with a full complement of players of which the majority of the players were playing at their first National Finals contest. 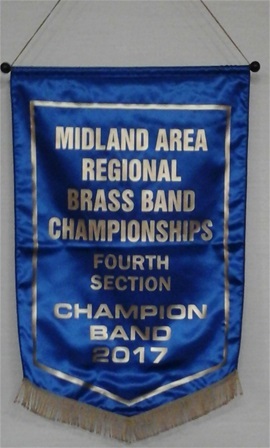 And most importantly - due to our 1st place win at the Midlands Area contest in March we will be promoted to the 3rd section. Introducing our new band mascot. 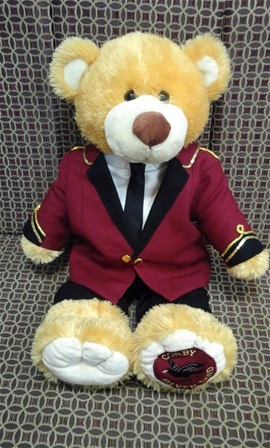 This lovely young man, who is still to be named, is our official Corby Silver Band mascot, who hopefully will help bring us success at the National Finals at Cheltenham in September. Many thanks to our flugel horn player, Sandra Preston for making his clothes to match the rest of the band. On Sunday 12th March, Corby Silver Band competed in the Midlands Regional contest, competing against 20 other bands. We were awarded 1st place out of the bands that played, and so we will be representing the Midlands area at the National Championships held in Cheltenham on Saturday 16th September. Our excellent result also means that we will be promoted to the 3rd section at the start of 2018. This year the band participated in the Oxford Brass Band Association Winter Contest for the first time. We went to the contest to give ourselves an opportunity to perform the area testpiece in contest conditions and recieve some critique from the adjudicator so we could tweak and fine tune our performance in time for the Regional contest two weeks later. Not suprisingly, all 10 bands that took part were all doing the same, and so played the same test piece 'St. Andrew's Variations' by Alan Fernie. We had put a lot of effort into our preparations and were well rehearsed and we felt our performance went well overall, and although we lost a few marks for not having a full percussion team, we were still awarded a creditable 5th place. 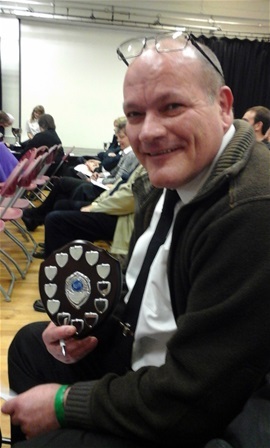 We didn't leave empty handed though, as our principal euponium player, David Parker was awarded the 'Best soloist' prize for the 4th section. The first performance of 2017 was as part of the production 'The Sounds of Home' composed by Paula Boulton. Paula had asked for ten members of the band to play as two quintets for the finale of her composition which was based on and celebrated the different musical styles which were named in response to her question "What sounds remind you of home?" "A piece about the Sounds of Home would not have been complete without the sound of Corby's Local Town Band! I can honestly say that the moment you appeared from behind the curtains was theatrical magic. The quiet solid presence you brought to the onstage dynamic plus the visual of the red blazers was exactly what I had intended - and that was before you had even played a note. The warmth of the sound you made was rich velvet dark chocolate and the associations that sound has for people in the audience - well it was pure Corby Hovis ! There was an actual gasp and a lot of open mouths and an awful lot of hankies and sniffing. And that was before the build up in the Orchestra. The joining of the two sounds and those two worlds healed a rift that should never have been there in the first place. A truly triumphant end to the concert. Thank you from the bottom of my heart to you all. x"